The cache is NOT at the published coords. 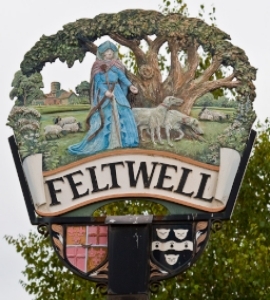 The name of Feltwell is derived from the Saxon meaning "the settlement in the meadow by the stream" and such a meadow forms the backcloth of the village sign upon which everything else is superimposed. Large flocks of sheep used to be kept by the Lords and Ladies of the seven Manors in Feltwell and sheep appear on the meadow to represent the ancient "Sheepwalks". The central portion of the village takes the approximate shape of a figure 8 and this fact is perpetuated in the octagonal base which is also meant as a permanent reminder that the turret of the formerly round-towered church of St. Nicholas was octagonal. At the eastern approach to the village, on a large grassy mound, stood a magnificent oak tree. Unfortunately it was considered to be unsafe and was felled on 23rd April, 1964. The massive trunk had a girth of 32' 6" and the tree, which was estimated to be some 1300 years old, is depicted in symbolic form on the sign. On the hill, St. Nicholas' Church, as it appeared before its tower collapsed (25th October, 1898) and before its thatched chancel was demolished (1862) commands a view across the meadow and also represents the Charity of Rev. Thomas Rawlins (a former Rector of St. Nicholas) which was set up under the terms of his Will, dated 26th August, 1729. Supporting the sign are two coats of arms, Moundeford and Clough. These are to celebrate the generosity of these families in setting up trusts. The Moundeford Charity originated in a Deed of Feoffment dated 10th September, 1642 and the two Clough charities under the Wills of Robert Clough (6th June, 1737) and Miss Pleasance Clough (12th June, 1847). Another charity is represented by the shortened shepherd's crook carved on the face of the supporting post. By his Will dated 6 October, 1579, Edward Atmere, a shepherd, gave £60 for the purchase of land, the rent from which was to be paid to the Churchwardens of Foulden, Northwold, Feltwell, Weeting and Brandon for the use of the poor, in such a way that each parish received the benefit of this charity every fifth year. In the 1960's the sites of a Roman Villa farm and its bath-house were excavated on land near Little Oulsham Drove and in the bath-house was found a Saxon(?) sword 29" long. This, too, is carved in miniature on the post. The sign was unveiled 9th August, 1969 by The Lord Lieutenant of Norfolk, Sir Edmund Bacon, Bart., K.B.E., T.D. who is the Premier Baronet of England and the Service of Dedication was conducted jointly by the Rector, Rev. Roger C. Frith and Rev. A. C. Windridge of the Methodist Church.